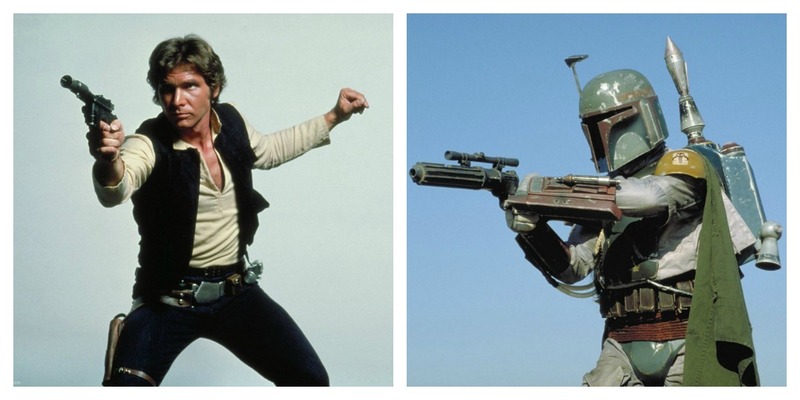 Two Tickets For...: Boba Fett and Han To Get Their Own "Solo" Films? Andrew: Hello readers! I'm in the process of transcribing our review of Warm Bodies right now, but I had to take a quick break and write up a quick update on yesterday's Around the Web post where Sarah and I mentioned Ain't It Cool News' scoop that Disney and Lucasfilm plan to make a stand-alone Yoda film. Well, after we posted that yesterday, Disney Chairman and CEO Bob Iger gave a conference call yesterday in which he confirmed their plans to make a bunch of stand-alone Star Wars films that will be released during the same time period that they will be releasing Episodes VII through IX. And today Entertainment Weekly reports that their sources have told them that two of the other stand-alone films Lucasfilm plans on producing will be a Han Solo origin story and a Boba Fett adventure! "The Han Solo story would take place in the time period between Revenge of the Sith and the first Star Wars (now known as A New Hope), so although it’s possible Harrison Ford could appear as a framing device, the movie would require a new actor for the lead — one presumably much younger than even the 35-year-old Ford when he appeared in the 1977 original. The Boba Fett film would take place either between A New Hope and The Empire Strikes Back, or between Empire and Jedi, where the bounty hunter was last seen plunging unceremoniously into a sarlacc pit. Exactly who would play him isn’t much of a complication – in the original trilogy, he never took off his helmet. And in the prequels, we learned he was the son of the original stormtrooper clone, played by Temuera Morrison, who’s still the right age for the part if his services were required." We had to imagine that Lucasfilm and Disney would want to make movies just like these because...well, because they're two films that Star Wars fans definitely would want to see, particularly a Boba Fett film where we watch him just go around being a BAMF. I'm also jazzed about the idea of a Han Solo origin film, watching his friendship with Chewbecca form and how they become the bounty hunting duo they come to be. If it's half as fun as watching Dr. King Schultz and Django become bounty hunting partners, this should be a blast. The biggest question in regards to a Han Solo film would, of course, be who gets cast in the role; whether it'll be a known quantity or if they can find a diamond in the rough like when Harrison Ford was cast in the original role. Speaking of Harrison Ford, there's certainly the question of whether or not either of these movies is even necessary and if Disney/Lucasfilm is going to ruin either character. But personally, in the right hands, I'd much rather see a movie where Han Solo becomes the man we're introduced to in A New Hope than I was in seeing how Anakin Skywalker became Darth Vader. Obviously it won't be Ford playing the role, and he's a large reason people love the character in general, but if you can get the right actor to play the role (much like Chris Pine nailing the new take on Captain Kirk) then I think it'll be easier to digest. As EW also cautions, Disney/Lucasfilm could very easily change their minds about one or both of these films, as they're only an idea right now, but again, these are two of the easiest calls to make. Iger mentioned in the conference call that Lawrence Kasdan (who wrote the screenplays for The Empire Strikes Back and Return of the Jedi) and Simon Kinberg (Mr. & Mrs. Smith) are currently at work developing the spin-off movies Disney/Lucasfilm has planned, so I'd imagine these two are included in that. What do you guys think of the possibility we see these two films within the decade? Who should play a young Han Solo? And should they bring back characters like Darth Vader and Jabba the Hutt to play a part in the proceedings?